Originated in 1946 and incorporated in 1948, Danville Metal Stamping Co., Inc., has grown from a three-person shop producing straightforward stampings to a 450-person company producing a variety of metal components for the aerospace and gas turbine industries. Companies such as Pratt & Whitney, General Electric, Honeywell, Hamilton Sundstrand, Siemens Westinghouse, and Rolls-Royce depend upon Danville Metal for a variety of gas turbine and aerospace hardware. While striving to access the latest in technological advances, Danville Metal prides itself in moving systematically forward to make the most of those advances for the Company, its employees, and its customers. In its progress, Danville Metal has never lost sight of its basic strengths in the areas of forming, machining, and joining technologies. Danville Metal continues to search out ways of expanding and complementing those capabilities. In addition, Danville Metal is constantly searching for means of becoming more self-sufficient and minimizing reliance on outside contractors. Danville Metal is an experienced, single-source provider for all your manufacturing needs. We’ve worked hard to earn our excellent reputation, and customers around the world trust the high levels of quality, service, and product reliability that have become our hallmark. State-of-the-art technology, experienced engineers, skilled quality professionals, and a dedicated workforce focused on unparalleled quality, allows us to manufacture parts in a timely and cost-effective manner from process planning to delivery. Customer-designed hardware, produced to the highest quality standards has been our legacy for over 65 years. Decades of experience, industry-leading technology, and a commitment to complete customer satisfaction—that’s the DMS solution for all your procurement needs. “By building our plant in Danville, Illinois, Danville Metal has become part of the community. We are here to manufacture quality products. The best in know-how, machines, and materials have been employed to ensure our objectives for the mutual satisfaction and benefit of our customers, our employees, and our company to whom we are dedicated to produce the best products at competitive prices. The continued growth of our company is directly related to the skills, interests, pride, and abilities of our people and how well we all work together as a team. 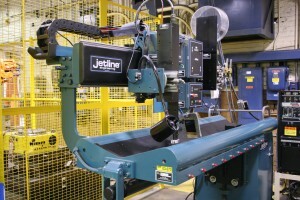 That commitment to self-sufficiency led to the acquisition in 1984 and merger in 2017 of Thermo Techniques, a brazing and heat-treating company located adjacent to Danville Metal’s Oakwood Avenue facility. Danville Metal has made the transition from manufacturing departments to manufacturing cells, which utilize flow lines. These cells enable Danville Metal to shorten delivery cycles and promote higher quality parts while giving all employees a sense of ownership in the finished product. Into the future expect no startling changes at Danville Metal. Rather, expect to see more of Danville Metal’s consistent evolution of technological capabilities and manufacturing approaches leading to improved service, quality, and lower costs for our customers. Contact us and give us an opportunity to meet your manufacturing needs. ©2019 Danville Metal Stamping Co., Inc. All Rights Reserved.